WELCOME TO THE BLOCK VISTA B&B WEBSITE. We would like to introduce ourselves as your hosts, Doug and Chris Beck from Bullcamp, Nanango which is located in the beautiful South Burnett Region of Queensland, Australia. Doug grew up on the Atherton Tableland and Chris in Central Queensland. We had many enjoyable years living and working in Rockhampton before making the move to our current property. 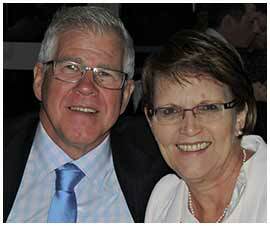 We have been married for nearly 40 years and have three grown up children and four wonderful grandchildren. We love our little piece of paradise and it gives us great joy to be able to share it with you. Contact us via mobile +61 473 205 139 or email us at info@theblockvista.com.au with your booking enquiry today.